Shop Discount School Supply, online at DiscountSchoolSupply.com, for various school supplies, arts, and crafts for kids. Discount School Supply carries the basics, like crayons and glue, to puzzles, special needs products, furniture, strollers, and cribs. Discount School Supply also sells allergen-free items, as kid safety is of utmost importance. Take advantage of free resources and curriculum supplements, as well as active play products to enhance your child’s motor skills. Be sure to check RetailSteal.com first for Discount School Supply coupon codes, Discount School Supply promo codes, and Discount School Supply discounts. 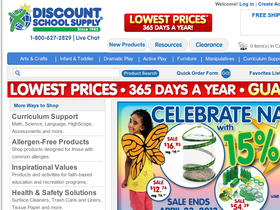 Discount School Supply offers free 2-day delivery on orders over $79 within the contiguous US. Orders outside of the 48 contiguous United States will ship via USPS Priority Mail. For returns, please contact customer service. Use this coupon code on Discount School Supply to save 15% sitewide. Click to save. Shop at Discount School Supply and enjoy 15% savings on all orders. Click here for code. Enjoy free delivery on your orders of $79 or more from DiscountSchoolSupply.com. Show the clearance section online at DiscountSchoolSupply.com and save up to 70% off retail! Head over to Discount School Supply today and save up to 69% on new items. Click to shop. Shop at Discount School Supply and enjoy 10% savings on all orders. Click here for code. Save up to 30% off retail on Crayola at Discount School Supply. Click link to purchase. Shop DiscountSchoolSupply.com and save 30% on Crayola items. Click link to shop and save now. Click link to shop for Angeles products from Discount School Supply and save up to 30%. Shop at Discount School Supply and enjoy 15% savings on Biocolor products. Click here for code.